Take Current Affairs quiz February 4, 2019 to enhance your General Awareness. Practice with our esteemed Current Affairs quiz February 4, 2019 questions which covers all important events across India as well as World. Make use of all important Current Affairs quiz February 4, 2019 questions with answers updated here, at free of cost to succeed in all competitive Exams and Interviews. Bihar State government has approved the 10% quota bill for the Economically Weaker Sections (EWS). Choose the correct answer. The Bihar Cabinet has approved a draft Bill on providing 10% quota in government jobs and educational institutions to the Economically Weaker Sections (EWS) among the general category. The Chief Minister of Bihar is Nitish Kumar. Who is the U.S. special representative on North Korea? The U.S. special representative on North Korea is Stephen Biegun. NPPA controls the prices of pharmaceutical drugs in India. NPPA stands for _______. National Pharmaceutical Pricing Authority (NPPA) controls the prices of pharmaceutical drugs in India. Which State became the first to set up a Price Monitoring and Research Unit (PMRU)? Kerala has become the first State to set up a price monitoring and research unit (PMRU). This unit will track violation of prices of essential drugs and medical devices under the Drugs Price Control Order (DPCO). Who is appointed as the MD and CEO of Corporation Bank? The government has appointed P.V.Bharathi as the Managing Director and Chief Executive Officer of Corporation Bank. Earlier she has served as the Executive Director of Canara Bank. Who was the first recipient of K.Veeramani Award? Mr.V.P.Singh, former Prime Minister of India, was the first recipient of the K.Veeramani Award. Who received the K.Veeramani Award for Social Justice 2018? K.Veeramani Award for Social Justice 2018 will be conferred on P.S. Krishnan, former Secretary, Government of India . When is the International World Cancer Day celebrated? World Cancer Day is an international day marked on February 4. Which organisation developed the World Cancer Declaration 2008? World Cancer Day was founded by the Union for International Cancer Control (UICC) to support the goals of the World Cancer Declaration, written in 2008 which was developed by it and adopted by the World Cancer Summit 2008.
Who Tops Womens ODI Batting Record? Smriti Mandhana Tops Womens ODI Batting Record. Which country won their First-ever Asian Cup Title In Football by defeating Japan? Qatar won their First-ever Asian Cup Title In Football by defeating Japan. Which Ministry approves procurement of 73,000 assault rifles from US? Defence Ministry approves procurement of 73,000 assault rifles from US. Which State declared dolphin as State aquatic animal? Who launched second phase of Pasupu-Kumkuma scheme, welfare pensions? Shri Venkaiah Naidu launched second phase of Pasupu-Kumkuma scheme, welfare pensions. Are you looking for right place to enhance your Knowledge on Current Affairs of 4th February 2019 through effective Quiz section? FreshersLive grants you the advantageous Current Affairs Quiz questions with accurate answers for 4th February 2019 which covers all the important events, supreme Awards, major occurrences in the National as well as World level. 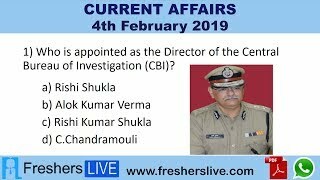 All important Current Affairs Quiz questions of 4th February 2019 are updated instantly in this page. Everyday at least 25+ Current Affairs Quiz Questions are displayed in this FreshersLive page. Correct Answer for each quiz question is given at the end of the entire 4th February 2019 Current Affairs Quiz questions section. You can estimate and upgrade your GK by attending these useful quiz questions. Entire quiz questions of 4th February 2019 Current Affairs covers Competitive Exam as well as Interview point of essentially important topics like International News, National News (ie. Indian Affairs), Science & Technology News, Environmental News, Bills & Acts Passed by Government, Defence News, About important Persons, Places, Banking & Economical News, Awards & Honours, Sports News, Revolutionary Updates on Arts & Culture, Obituary, Summits & Conference, Important Committee, Schemes, Appointments, Important Days & its Theme for Current as well as upcoming Year, Books & Its Authors, Agreements & MoUs, Budget, Taxes, Various Important Lists & Indexes, Visits by World Presidents, Prime Ministers, Political affairs and all Current Events. 4th February 2019 Current Affairs Quiz Questions updated in this page are prepared in the sense to help all aspirants to succeed in various Competitive Exams like UPSC IAS and other Civil Services Examination, Various Bank exams like IBPS PO, IBPS Clerk, SBI PO, SBI Clerk, RRB PO, RRB Assistant, Insurance exams like LIC AAO, UIIC Assistant, Railway Exams, Various Central Government Exams like SSC CGL, SSC CHSL, and more. Attempt all the Current Affairs Quiz Questions of 4th February 2019 and evaluate your score by matching your response with the correct answers mentioned at the end of this quiz questions section. By practising the FreshersLive Current Affairs Quiz Questions on a daily basis, you can surely succeed in the competitive exams as well as the interviews easily. Make use of this ultimate resource to the fullest and quickly achieve your goal!